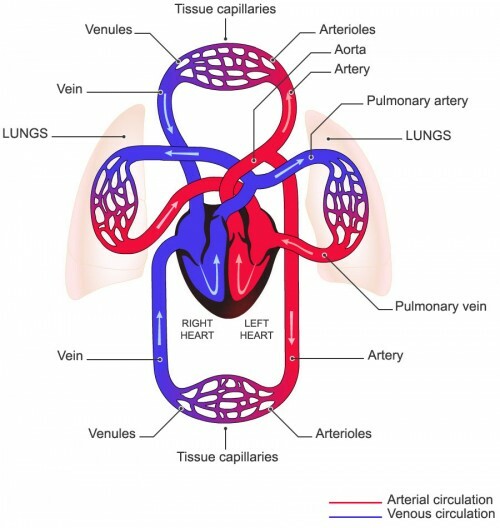 The first step in understanding compression is to understand the circulatory system (fig 1). The circulatory system includes the heart and blood vessels (arteries, veins and capillaries). The heart acts as a pump, moving blood around the body through the network of blood vessels. Arteries carry blood with oxygen & nutrients from the heart to the tissues and organs. Veins return blood loaded with CO2 and toxins back to the heart (fig 2). The arteries and veins are linked by microscopic capillaries, where there is an exchange of oxygen, carbon dioxide and metabolites. Veins have a tubular structure with a thinner, suppler muscle layer than the arteries. In the legs, the blood has to flow upwards against the pull of gravity. 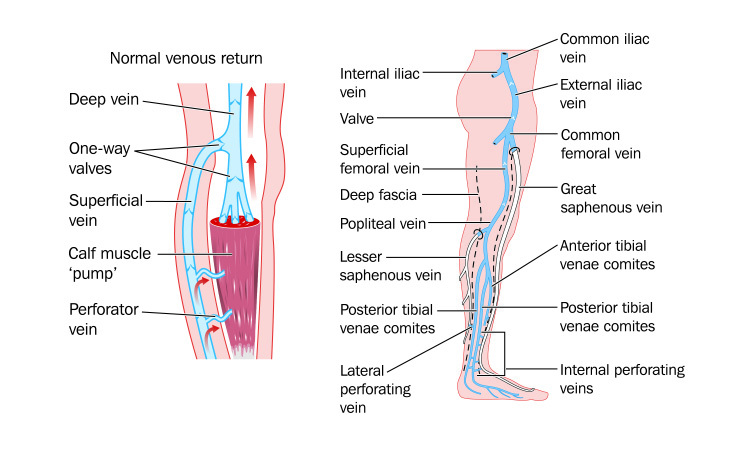 To help, veins are equipped with non-return valves that allow blood to flow upwards but cannot flow back down (fig 3). 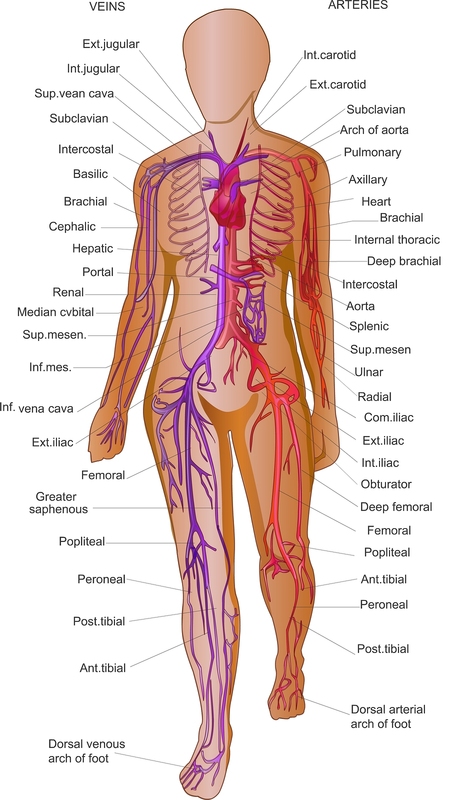 The deep venous system is located in the central axis of the leg, follows the arteries and is surrounded by muscles. The veins have the same names as the arteries that they run alongside: iliac, femoral, popliteal, fibular, tibial. By alternately contracting and relaxing (massage effect), the calf muscle acts like a pump to propel blood from the peripheral tissues towards the heart and from the superficial network of veins towards the deep network. The average venous pressure (measured at the ankle in millimetres of Mercury/ mmHg), fluctuates depending on the person’s posture. These fluctuations are due primarily to gravity. Fig 5a. Fig 5b. Fig 5c. In addition, due to the effect of gravity, pressure naturally decreases from the ankle to the thigh. Venous leg ulcers account for 70 – 75% of all treated leg ulcers.2 Venous leg ulcers usually develop when the calf muscle pump is unable to return venous blood to the heart effectively. This may be due to damaged valves within the vein, immobility or disability. 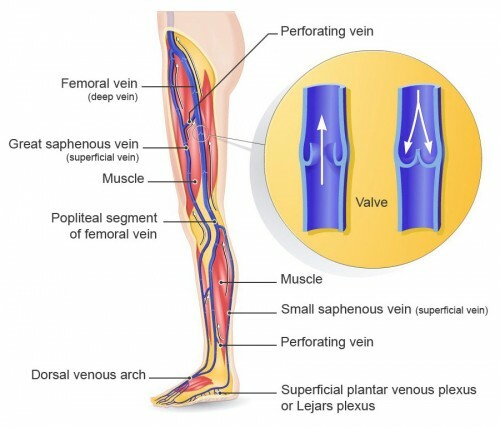 Incompetent valves allow back flow of blood (reflux) from the deep veins resulting in high pressure within the superficial veins (venous hypertension). The increased pressure causes proteins (from the breakdown of the haemoglobin) to leak from the capillaries resulting in brown staining of the skin – haemosiderin staining – which can lead to tissue breakdown. Varicose Eczema and hardening of the tissue (lipodermatosclerosis) are further symptoms of venous insufficiency and can contribute to ulcer formation. Arterial leg ulcers account for 10 – 15% of all diagnosed leg ulcers. Arterial leg ulcers develop when there is a reduced arterial blood supply. This can be caused by atherosclerotic plaques (Peripheral Arterial disease) which narrow the artery.3 It can also be the result of emboli which lead to an infarct of the tissue. There are a number of signs and symptoms that can help identify venous leg ulcers and arterial ulcers (table 1). Approx 10-15% of all leg ulcers are a result of mixed venous and arterial causes and are known as mixed aetiology ulcers. Rheumatoid arthritis (RA) accounts for 3% of all ulcers. RA ulcers are caused by associated micro-vascular disease leading to occlusion of smaller vessels and tissue breakdown. Diabetes currently accounts for 5% of ulcers. However, this figure is rising with the escalating incidence of diabetes. People with diabetes are at risk of developing peripheral vascular disease and atherosclerosis. There may be reduced sensation in the limbs due to peripheral neuropathy and a greater risk of sustaining injury, often unnoticed by the patient. Diabetic ulceration usually occurs on the feet and can also be caused by deep tissue injury from un-noticed pressure, especially on heels. Podiatrists linked to a diabetic service are the best clinicians to deal with this type of damage as they are trained to remove the devitalised tissue as quickly as possible to prevent infection. Graduated compression hosiery works by gently squeezing the leg to assist the blood flow through the veins in the leg, back to the heart. The compression applied by the hosiery is greatest at the ankle and reduces as it moves up the leg, ie, “Graduated compression”. 4 This means that it is particularly effective in maintaining a good blood flow and reduces the risk of either developing a new leg ulcer or having a healed leg ulcer break down and recur.